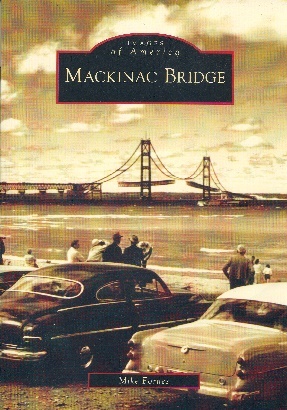 on November 1, 1957, traffic officially opened on the Mackinac Bridge. That was the culmination of 70 years of talking und dreaming about a bridge across the Straits of Mackinac, of discouraging attempts for legislative and congressional approval, of efforts to raise the funds, and finally of a three-year construction programm nessary for the world`s longest and costliest (to date) suspension Bridge. Michigan`s greatest symbol is expertly maintained, fully funded, and amazingly resilient to many forces and factors of man and nature that have failed to seriously affect its status as the lone highway link between Michigan`s two main peninsulas. The "miracle bridge" at the Straits of Mackinac truly allows a view that epitomizes the state motto of Michigan, Si quaeris peninsulam amoenam, circumspice, or "If you seek a pleasant peninsula, lokk about you."